Greetings everyone, I hope this message finds you all in good health and happiness. Here at the Chamiza Foundation we are steadily moving along in the New Year. We had our first board meeting for the year on March 8, 2019. Please check out the “Impact” page to see who was awarded for the first round of 2019. Our next application deadline is May 17, 2019. If you have any questions about how to submit your application, please do not hesitate to reach out to me. You can now apply directly online through our website. Please be aware that when you start the process you cannot stop and save your application, you must start and finish in one sitting. So please have all your documents that you will need to complete the application on hand. You can also still download the application from our website as well. Since I have been in this position, I have had the opportunity to visit some of our Pueblo communities, to sit in on programs and observe project sites. I am so amazed at the people I meet and the things I see. The programs and projects that I observe are so informative and inspiring. Recently, I was invited to Zia Pueblo to observe their language and culture class. The class takes place after school for an hour. The teachers and the students make the most of that hour by speaking Zia Keres and practicing songs and dances. I was absolutely thrilled to see how engaged the students were with the activities taking place. The students introduced themselves to me in Keres and then performed three dances for me. All of this truly made my heart happy. This is what makes me so grateful to be a part of the Chamiza Foundation. I look forward to seeing many more great application for our next round of funding. If you have a project or program idea that you need help developing please feel free to contact me. Wishing everyone a great spring. The idea for a Tiwa language program came about in 2001 by the Youth Program Director. The director introduced the idea of a Tiwa language program for children in the Pueblo. At that time Picuris Pueblo had applied for Chamiza Foundation funding and was able to provide the language program for one year. The program was so well received and so successful that several years later it resulted in the Peñasco School District providing three hours of language instruction each school week during the school year for 32 Picuris children. The Picuris Pueblo leadership realizes that Tiwa language instruction needs to take place on the Pueblo and not just for a few hours a week in public schools. They recognize how important it is to include adult family members, engage the help of elders, and have a more immersive and effective learning experience. 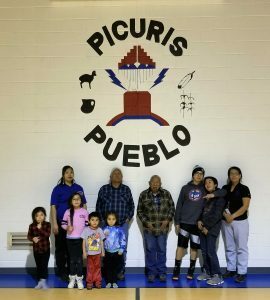 In the fall of 2018, Picuris Pueblo submitted an application to help Picuris children learn the Tiwa language better and to engage adult family members in learning Tiwa so that the learning experience is more effective and inclusive. Their application was approved and they have been providing classes since the fall of 2018. There is a wide range of youth and elders that attend the classes. They are currently trying to get more elders to participate in their program so that youth can learn about the history of Picuris Pueblo directly from their elders. The Chamiza Foundation Director had the opportunity to visit the program and sit on an artifacts presentation, hear a Picuris hunting story and was able to partake in a traditional meal with program participants. 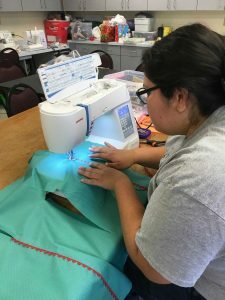 The Pueblo of Sandia sewing program began in 2004. The program was created to provide a space for tribal women to gather for sewing instruction, collaboration and discussion. The program also included a Tiwa Talking Circle group to promote language acquisition, which continues today. Since then the program has grown to provide beginning instruction for adults and youth from 4th grade and higher in year round programs that include after school, winter and summer break programs. 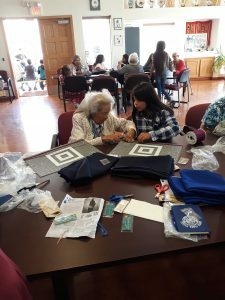 The program currently provides 20 hours of weekly sewing instruction for adults and kids, with some of the after school hours dedicated for intergenerational activities. The types of products the participants currently make include traditional wear for women and men, shawls, pillows and pillow cases, small blankets, ornaments and items for feast and other tribal functions. Sandia Pueblo submitted an application to the Chamiza Foundation in 2018 to ask for support for this program. They awarded funding to assist with this program. This is an ongoing project, which is supported partially by the tribe. Thus far, they had had 12 participants who range in age from 10-18 and 15 participants who range in age 19 and over. They anticipate having more participants during the summer. Currently, participants are preparing clothing and accessories and table clothes for St. Anthony’s Day Feast which will take place this June. The Santa Clara Regional Adult Day Care Center submitted an application to the Chamiza Foundation in the spring of 2018. They were provided funding for their program that encouraged intergenerational exchange between the elders of Santa Clara and the Santa Clara Day School. The center was proposing to create an interactive learning space for elders, adults, and youth to work together engaging in activities such as gardening, preparing traditional foods, craft making, and oral storytelling. The program officially began in the fall of 2018. The Santa Clara Day School 6thgrade classes go to the Adult Day Care Center once a week where they participate in various activities. The female elders have been teaching the girls how to make the traditional black mantas and shawls and the male elders have been teaching the boys how to make the traditional rattles, arm bands, leg bells and head dresses. Furthermore, the Adult Day Care provide story telling in October which was tied into the school’s curriculum, which was folklore. One of their elders has the stories of the different pueblo dances and the meaning of them. She shared this with the other elders and students. Our Executive Director recently went to visit the Santa Clara Regional Adult Day Care Center. She was happily welcomed and students proudly showed her the work they were doing. The 6th grade teacher informed our Executive Director that the students are always excited and eager to go to the Adult Day Care Center to work on their craft projects.